Judy Rodman - All Things Vocal Blog: Today Is World Voice Day! Every year on April 16, otolaryngologist-head and neck surgeons and other voice health professionals worldwide join together to recognize World Voice Day. World Voice Day encourages men and women, young and old, to assess their vocal health and take action to improve or maintain good voice habits. The American Academy of Otolaryngology-Head and Neck Surgery has sponsored the U.S. observance of World Voice Day since its inception in 2002. How is your voice feeling? sounding? What vocal techniques have you learned (and from where) that have helped you stay out of the otolaryngologist's office? What are your burning questions about how your voice works and what affects it? What are the ideas you want the sound of your voice to communicate? 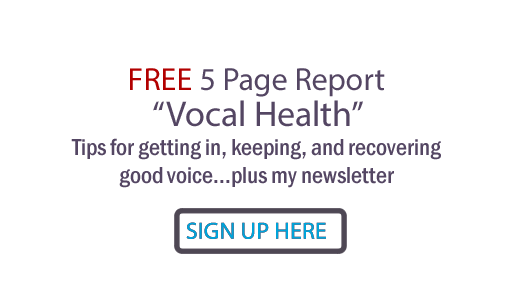 How do you maintain the physical health of your voice? Your answers to any and all of these questions will be shared with the community of blog readers here. We all thank you! Click the comment link at the website to share your thoughts. I am going to participate and answer your questions. 1. My voice is feeling great these days. I think it is because I have been eating better and getting plenty of rest. 2. I took some vocal lessons years ago that taught me how to breathe. I think that has helped my voice more than anything. 3. I guess my only question is how does one safely increase their range. 4. I love it when I hear how soothing my voice is. That's what I want to come across in my music and my voice. 5. I sing because I love to. It makes me happy. 6. I try to eat right, warm up and not smoke. Thanks Judy for posting this. It gives me some things to think about. Sorry, but Thursday, April 16, 2009 is actually World Voice Day. It is observed every year on April 16. OOps... When I wrote this post, I mistakenly thought it was the 16th!! Sorry for the mis-date, Jessica- and thanks for the heads up! Phil, thank you so much for your comments; tell you what, I will aim a post in the near future at increasing vocal range safely. Great subject, and I'm sure will be of interest to others. Anyone else got thoughts or questions? 1. When I sing, it feels a bit strained. Yes, bad, bad, bad. 2. Not hitting a high note by stretching my neck. And getting support from my abdomen, not my chest. Both from my mom, I think. She sang a lot when I was growing up. 3. Just how important is warming up, and what does it do? It seems like if you sing correctly, you shouldn't need to warm up first. 4. Whatever the ideas are in the song--emotion. 5. Because I can't not. It's in me. 6. Stop before it gets too strained. P.S. Have you seen that clip of 47-year-old Susan Boyle singing on Britain's Got Talent? I heard it's making quite a stir. Loved it. I've been incredibly busy lately so I'm still slowly working my way through your CD set in my spare time! I'll be in touch as I get through more of it. Hope you are having a wonderful day, and thank you for all the great information as always. To keep from straining, try some wall work... sing with head and heels against a wall. Imagine you are inhaling the song instead of exhaling it... this is a rock teacher named Jamie Vendera's imagery he calls "The Inhalation Sensation". Your question about warming up is a great one and I will do a blogpost on it soon. Thanks for the thoughts!! As for me... I'm such a cynic I think the whole thing was staged, and certainly wasn't a surprise to the judges. I know, kick me. I do believe this woman is legitimately who she is, and that she's made it despite the "powers that be", but not because of them. Quite frankly, she was a success when nobody knew her. I wish her the best and sweetest years of her life now.